"From amongst the multitude, God graciously appoints some selected people as His friends to preach His commandments for the benefit of mankind. Their one greatest qualification is that they renounce the wealth and pleasures of the world and dedicate their lives to the love, devotion and service of God and humanity. When others feel the pinch of sorrows and pain, they don't. When the world would have no such 'awliyya' then the Day of Qayamat would dawn upon it." As another of the awliyya passes away, only 40 days have elapsed since Al-Habib 'Abd al-Qadir al-Saqqaf (Allah be pleased with them) returned to his Lord, and the world is left in further darkness. The famous Wadi Hasan Mosque in Batu Pahat, Johor Dar al-Ta'zim, Malaysia, where Habib Ali al-Aydrus (Allah be pleased with him) was the Imam, cries for him today. He was a saint of great stature and was one of the last of his generation, and possibly the last in Malaysia . 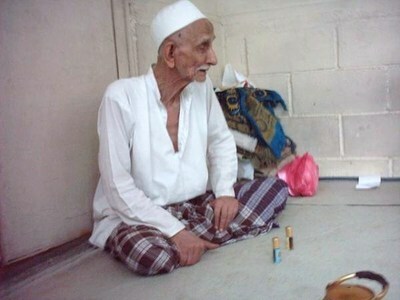 Habib Ali al-Aydrus passed away on Thursday 29th Jamadi Al Awwal 1431 [13th May 2010] at 5:10pm at his house, aged 97. Originally from Yemen, he settled himself in this fairly remote part of the state of Johor, but that did not stop people flocking to him from around the world. Habib Ali was well-known among the great Sufi masters of the Far East and the Arab world. Regular visitors such as my Sheikhs, the renowned scholar of Mecca, Sayyid Muhammad bin Alawi al-Maliki, Habib Zain ibn Sumeit, Habib Hasan bin Abdullah As Syathiri, Habib 'Abd al-Qadir al-Saqqaf and various other Habaib had benefited from this exemplar among the awliyya of Allah. He had a great maqam (rank) and he certainly is not only a jewel in the crown of Batu Pahat, but of a much bigger wilayat (area). We can only speculate on his role in the unseen realm. Habib Ali was a very virtuous man whose prayers were never rejected by Allah. Even during his old age, he would spend all his time welcoming guests, day and night, into his humble house. He would assign a week to himself, to spend in ibadat (prayers), and leave the following week to receive guests. He preferred for people not to look at him and despite having poor vision could tell if anyone was secretly watching him. The room that he used to sleep in was not comfortable but he did not seem to care about comfort. Habib Ali used to recite Yaseen and al-Mulk after Fajr and Maghrib prayers and al-Waqi'ah after Asar. But when he became older, he did not recite the Qur'an as much due to poor vision and memory, yet he would continually perform his Awarad and Wird (Prophetic invocations) day and night, as he did not sleep much. Habib Ali's father, Al Habib Ja'far al-Aydrus, was one of the great and noble men acknowledged by Allah, famous all over the world, and named as one of the connoisseurs in Siddiqiyyatil Qubra. Habib Ali was very humble and always kept his head bent down with politeness; he was a man with a gentle voice and full of love. The light on his face was like a dazzling diamond in the darkness of the night. Indeed, a friend of Allah is one who is humble and always loves to serve the poor, just like the Prophet (Sallallahu alaihi wa Sallam). He was a mercy to all who knew him and all who may not be aware of his presence. May Allah bless Habib Ali's soul. Al-Fatih'a. Time passes and he knows not its reckoning as he is made to quaff the wine."